It's been a really long time since I got out my Konad Nail Art Stamps, and now that my nails are getting a little bit longer (when I'm not filing them into oblivion, because I still cannot get the hang of this filing lark! Seriously, someone come and file my nails for me. I'll pay you in chocolate!!). So, this Nail of the Day is dedicated to that slightly forgotten art form that is Konad. I actually tried something very different this time, and used a full nail stamp. I've never used a full nail one before, because I've never had the nails to warrant it and didn't really see the point. 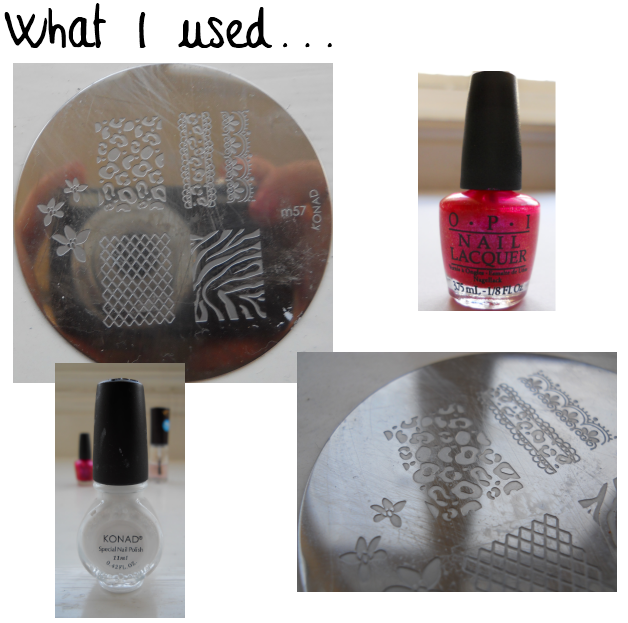 But, I fancied something different and here is how they turned out! I really need to stop using that pink polish don't I? But honestly, that polish alone was worth the price I paid for the whole set. It's just such a vivid colour that really sparkles, on it's own and I love it....if you hadn't already guessed! 1. It didn't stamp very well, at all. As in, most of the polish remained on the stamp, which was a bit rubbish. 2. What did stamp onto the nail didn't show up very well. So, I changed over to the white polish instead, and I love the overall look that I (eventually) got from this stamp/colour combination. As you can imagine, it was a right pain in the bum, to photograph the Image Plate, so say hello to my Camera, and the reflection of the window. Unfortunately, there was nothing I could do about that, but it's still annoying none-the-less. Maybe one day, I'll learn how to do it without getting reflections. Like, how do retailers take photos of mirrors for sale, without the camera in the image? Interesting, thought! Anyway, the image plate that I used was M57, and I used the spots image in the top left of the plate. The polish was, yet again, OPI's Be a Dahlia Won't You? which featured in my Mirror Mirror Pink Delight NOTD look a few weeks ago. The image above, of the polish, is a much better representation of the colour, than the picture I used in my previous post. Probably because this time I used natural lighting! Whilst I do really love this look, it wasn't the easiest one to do, and I don't think I have the patience to do it again, personally. Anyone who is familiar with Konad, will probably know that sometimes, it is just a pain trying to get it right. Either I wasn't scraping the polish off the plate fast enough, or I stamped it in the wrong place on my nail, or I was just getting polish all over my hands!! And god, I wish I'd taken a photo of how messy my hands were by the end of doing this look, not only on the palms of my hands, but also all over the fingers. Basically, I think that the problem with doing a full nail stamp, is that the image is never going to be the perfect size for all of your nails. And in my case, it was the perfect size for absolutely none of them! For my finger nails, the stamp was just too broad, and I ended up stamping just as much onto my skin, as I got onto my nails. On the first image, at the top, on the left, you can see that there is still some white print remaining on my pinky finger! In the end, I can just about get around them being too wide, because I can at least remove the excess polish from my fingers. But, the thumb nails are the complete opposite, in that they just weren't broad enough for me and hence I ended up with nails that only looked half done, hence why there are no images of my thumb for this one! I know some people would just say to do another stamp in the space, but I don't know about anyone else, I just cannot line up stamps to do that. So, I didn't bother. If you haven't yet had chance to try out Konad, and are interested, but don't know where to start, I actually wrote an FYI post regarding Konad, last June that you might find useful. It offers help and tips for which products to buy etc. Are you a fan of tiger and leopard prints?